The British Press is riveted by an apparent assassination attempt against a former Russian intelligence agent now living in the UK. 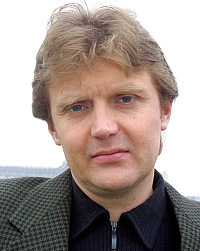 On Sunday, the British press exploded with reports about the poisoning in London of KGB defector Colonel Alexander Litvinenko (pictured above, circa 2002), who had been in the process of investigating the murder of Anna Politkovskaya to see whether the KGB (now called the FSB) was involved. The Associated Press reported that “Toxicologist Dr. John Henry, who has been treating Litvinenko, told the BBC that the former agent had been poisoned by thallium — a toxic metal commonly found in rat poison. ‘It points to that in his blood stream,’ he said.” The Times of London reported that the symptoms appeared just after a meal at a restaurant with a former friend who ate nothing and had promised leads on the investigation. Alexander Litvinenko was poisoned on the direct orders of the Kremlin because of his biting mockery of President Putin, according to a former Soviet spy now living in Britain. Oleg Gordievsky, the most senior KGB agent to defect to Britain, said that the attempt to kill Mr Litvinenko had been state-sponsored. It was carried out by a Russian friend and former colleague who had been recruited secretly in prison by the FSB, the successor to the KGB. The Italian who allegedly put poison in Mr Litvinenko’s sushi “had nothing to do with it”. Mr Litvinenko, who fled to Britain in 2001, was a target because of the Kremlin fury at his sarcastic attacks on President Putin, Mr Gordievsky said. Former Russian spy Alexander Litvinenko made a secret tape recording alleging assassination plots sanctioned by the Kremlin before he was poisoned. The tape was being passed to the security services today as Mr Litvinenko's condition deteriorated and his treatment in a London hospital became a fight to keep him alive. Mr Litvinenko, 44, fell ill after being poisoned with thallium, believed to have been slipped into his food or drink, the Mail's sister paper, the Evening Standard, has revealed. Details of his condition emerged as Scotland Yard revealed detectives were examining possible links with a petrol bomb attack on his family's north London home in October 2004. Mr Litvinenko defected to Britain from the Russian state security service and has been a critic of President Vladimir Putin's government. In the recording handed to Special Branch and MI5, he reveals details of extrajudicial killings carried out in Russia while Mr Putin was head of the country's FSB security agency. A transcript has been shown to the Standard and is likely to interest Britain's security service due to suspicions Mr Litvinenko has fallen victim to a politically motivated assassination bid. Detectives investigating the poisoning are focusing on a mystery hotel meeting he had with a former KGB officer on the day he fell ill.
A close friend of Alexander Litvinenko revealed that the dissident had met two men at a hotel in central London. He said one of the men was a former KGB officer, who was known to Mr Litvinenko. The meeting took place after the 44-year-old Russian met an expert on the Italian underworld at a Piccadilly sushi bar. Police believe the hotel was more likely to be the place where the former KGB colonel was poisoned. He was admitted to intensive care at University College Hospital last night after his condition deteriorated. Friends say he has only a "50/50" chance of survival. 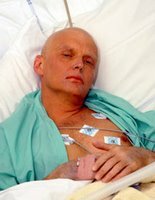 Mr Litvinenko was taken violently ill on 1 November after swallowing the deadly toxin thallium, a colourless and odourless chemical once used in rat killer. Fellow dissidents in London have accused the Kremlin of being behind the assassination attempt because of Mr Litvinenko's criticism of the Putin regime. The case is being investigated by Scotland Yard's specialist crime directorate. If police find the poisoning leads back to Moscow it could plunge Britain into its worst diplomatic crisis with Russia since President Putin came to power. 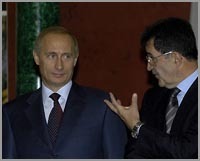 Earlier this year Litvinenko disclosed to a politician of the United Kingdom Independence Party that current Italian Prime Minister Romano Prodi--who also served as President of the European Commission, the European Union's executive body--is a KGB agent. According to Litvinenko, one of his former superiors FSB Deputy Chief Anatoly Trofimov--who along with his wife were assassinated in 2005--was the source of this information. Another former KGB defector, living in Britain, has confirmed Litvinenko's allegation, as related in the European Union Reporter.